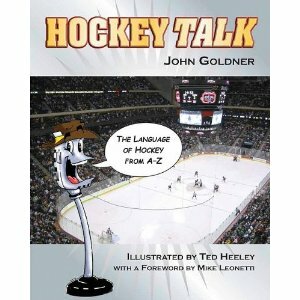 John Goldner and illustrator Ted Heeley have teamed up to give us Hockey Talk: The Language of Hockey from A-Z. There seems to be a number of different books in recent years dedicated to hockey terminology. But this one is special in that it is specifically geared at younger readers, specifically kids in elementary and middle schools. And hey, aren't those the people that who would best appreciate a book a hockey dictionary? They will appreciate the Goldner's clear and entertaining approach on over 300 hockey words and phrases. And Heeley's humorous cartoons scattered throughout never give any impression that this book is technically a reference book. No, it is a fun book that entertains and engages young readers. The book, which features a foreword by noted children's hockey author Mike Leonetti, is an excellent choice for the young reader/hockey fanatic on your shopping list. Hockey Talk: The Language of Hockey from A-Z is published by Fitzhenry and Whiteside. Check out the Hockey Talk website for some fun puzzles and word games.